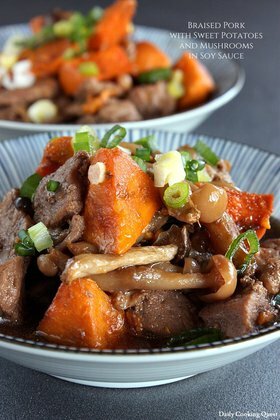 Chanpuru (チャンプルー) is an Okinawan dish, meaning mixed. Surprisingly the term comes from Indonesian word campur, which of course means mixed! Among the many chanpuru dishes, the most famous and traditional one is goya chanpuru which consists of bitter melon, pork, tofu, and egg. You can also add other vegetables of your choice, such as carrot, green beans, and bean sprouts just to name a few. Prepare the bitter melon by first cut the melon in half lengthwise. With a spoon, scoop out the seeds. 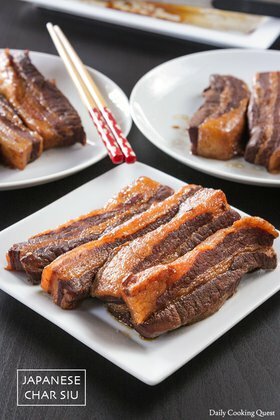 The, cut into thin 1 cm slices. To remove the bitterness, place the melon slices in a mixing bowl, and sprinkle with 2 to 3 tablespoon of salt, then massage the salt gently in to the melon. Let rest for 15 minutes, then wash and drain to remove the salt and bitterness. In another bowl, mix together thinly sliced pork and katakuriko. Set aside. Heat 1 tablespoon oil in a non-stick frying pan. 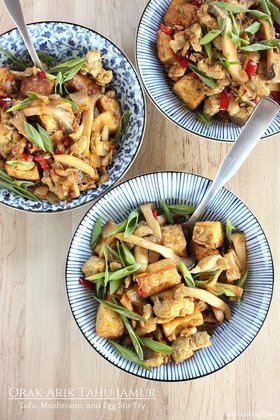 Fry tofu until golden brown, set aside. Add 2 tablespoon sesame oil to the pan, sauté pork until no longer pink. Add bitter melon, mix well, cook for 1 minute. Return tofu to the pan, and add in the sauce. Mix well. Cook for 1 minute. Slowly pour in the lightly beaten egg into the pan. Mix well. Cook until the egg is no longer runny. Turn off heat. 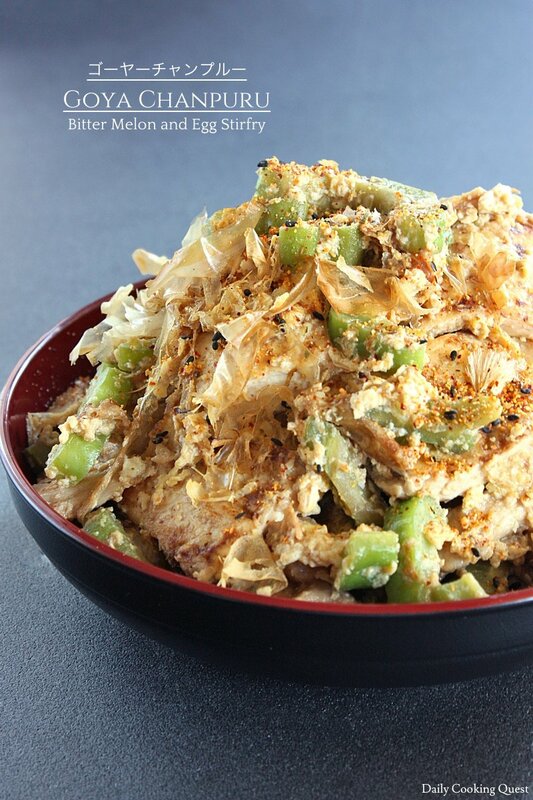 Transfer to a serving plate, sprinkle with bonito flakes and nanami togarashi. Served with steamed white rice.